Lisbon is known for the city of the seven hills and, this is due to the various climbs and descents that you will find in the city. 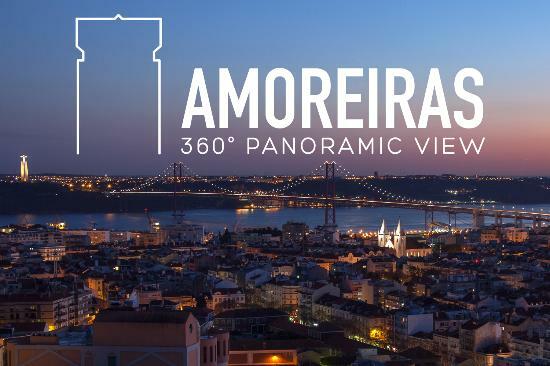 This leads you to have several places worthy of visiting and being lost in views of Lisbon, from the centenary monuments, the beauty of the Tagus river and the bridges that cross it, the colors of the roofs, the blue sky ... All this will lead you to fall in love with Lisbon for sure. However, in contrast to what happens in several cities in the world, there was no iconic location in Lisbon that would allow you to enjoy a 360º view of the city but, since 2016, Lisbon already has this special place, that is becoming a point of obligatory visit for who wants to know the city and to have the best view on her: we are talking of the Amoreiras 360º Panoramic View. 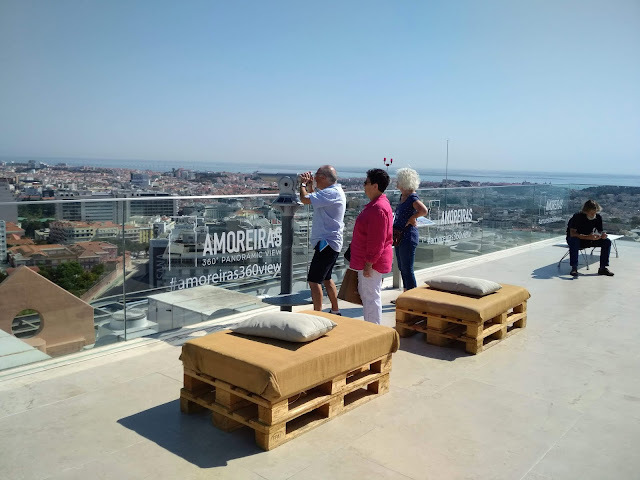 Separating the floor from this wonderful view is only a short 37-second journey in an elevator full of video images of Lisbon, that take you along 18 floors to the 174 meters high viewing point. 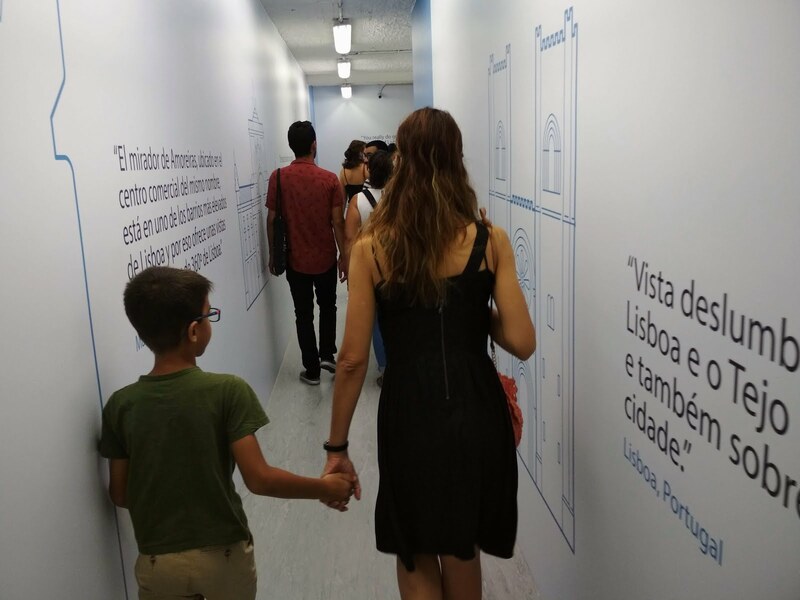 Although this attraction has already existed in our city for two years, we have only recently visited it and, let us say that we were amazed and, we come to recommend to those who come to Lisbon, whether it be on a family trip or not, as it is an ideal experience for all ages. 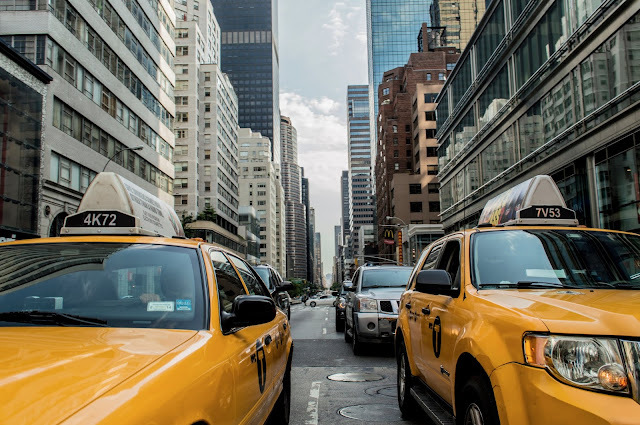 As usual, in addition to leaving our experience, we like to leave tips to help those who want to discover as well, because we know that for those who travel as a family, all the information that makes the experiences less complicated and prevent us from wasting time, are always very useful. 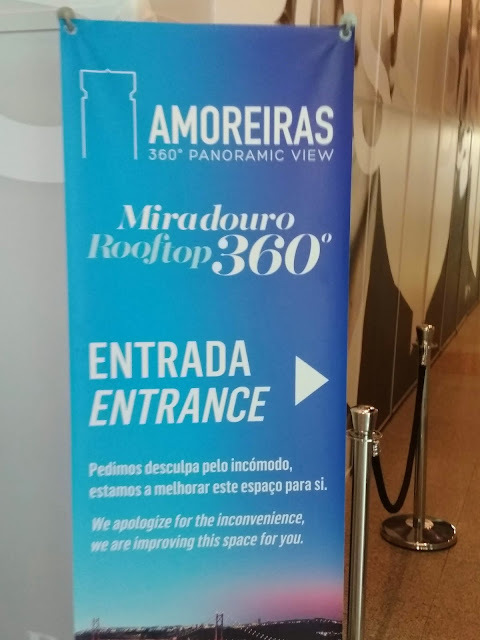 It is not difficult to find out where the Amoreiras 360º Panoramic View is, as it is in one of the most iconic and highest buildings of the city and, of them, which is also one of the most famous shopping centers, Amoreiras. As we have already mentioned in previous articles about the city of Lisbon, the ideal is to get around by public transport and the best way to get to Amoreiras is by metro, going out at Rato station or Marquês de Pombal. As it is at the top of a shopping center, it is ideal to join a visit for shopping as well as to have a meal, as there is vast dining space in the commercial center. But, if you drive by car, you can easily park in the parking lot of the Shopping Center, which is paid (you can see here the tariffs). As mentioned above, there is not much chance of being mistaken when it comes to reaching the Amoreiras Shopping Center, just go to Tower 1. 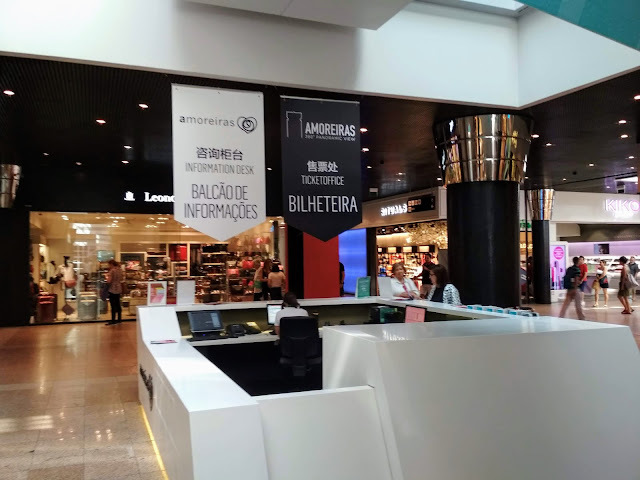 After entering the Shopping Center, you should go to the information desk, located on the ground floor. It will be at this Information Desk that you must buy the tickets and, after purchasing them, to get on the elevator, you only have to climb the escalators closest to the Information Desk. After climbing, if you look at the ground, you will see the indications on the ground that indicate the direction for the Amoreiras 360º Panoramic View, so just follow the arrows. If you have some difficulties in finding the space, just look for the area of the cinemas, because the elevator is close to that area. 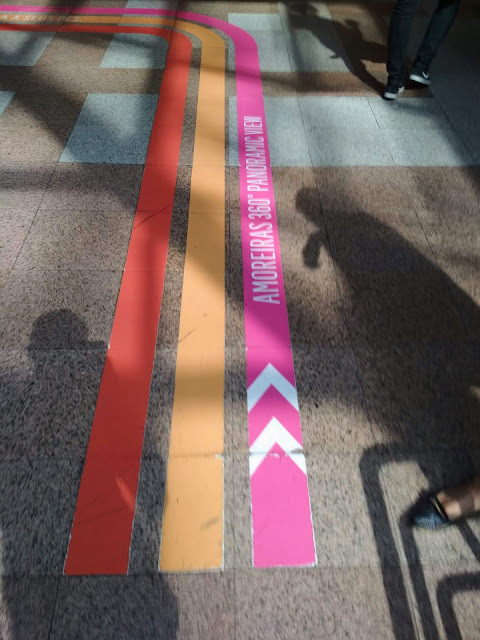 Having your tickets, just go to the official who is next to the designated place and wait your turn to go up. The experience of the elevator itself is very pleasant, as you will be surrounded by screens that, in a subtle way show Lisbon images that will increase your anticipation of reaching the destination of your route. 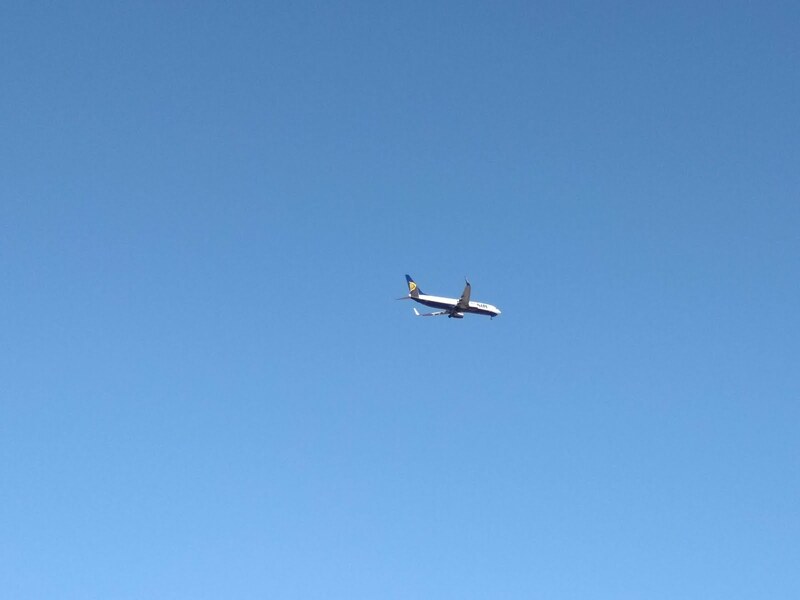 Despite the screens, the trip is made with reduced light and, in our case, when we arrived, we were invaded by the beautiful blue of the city of Lisbon (when you come to Lisbon, you can prove that there is no blue like the sky in our city). Then you can just let yourself fall in love with Lisbon during your experience, we promise, the landscapes are breath-taking. 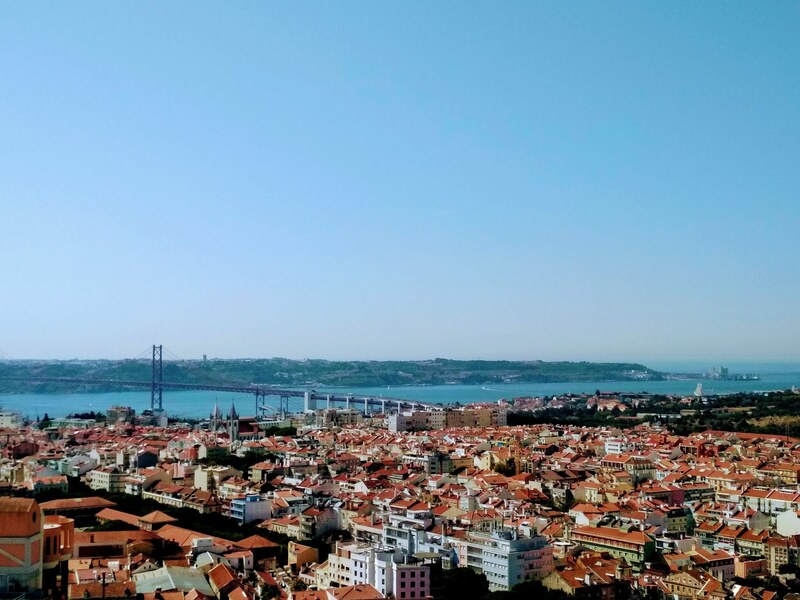 The visit takes around 15 minutes, along which you can look for historical sites in Lisbon, using the strategically placed information maps that will help you identify the treasures of the city of Lisbon. Something also very useful is the existence of lunettes that will help you to look more closely at the environment around you. In the case of our son, he simply loved watching the cars crossing the 25 de Abril Bridge, as well as seeing the planes landing and taking off from Lisbon Airport. Free entrance for children up to 5 years old. Monday to Friday: 10:00 a.m. to 12:30 p.m. | 2:30 p.m. to 6 p.m. Weekends: 10:00 a.m. to 6:00 p.m.
Monday to Friday: 10:00 a.m. to 12:30 p.m. | 2:30 p.m. to 10 p.m. Weekends: 10:00 a.m. to 10:00 p.m. June 21: Gazebo closed from 14h30 to 22h00. Every day: 10:00 a.m. to 10:00 p.m.
Monday to Friday: 10:00 a.m. to 12:30 p.m. | 2:30 p.m. to 10 p.m. Weekends: 10:00 a.m. to 10:00 p.m.
30 Monday to Friday: 10:00 a.m. to 12:30 p.m. | 2:30 p.m. to 6 p.m. Weekends: 10:00 a.m. to 6:00 p.m. The last climb takes place 30 minutes before the closing time. 24, 25 AND 31 DECEMBER AND 1 JANUARY Closed. We leave here our testimony of what we consider to be a visit to the city of Lisbon. The view is breathtaking and also the visit to the Amoreiras Shopping Center is a great walk, with several dining options. 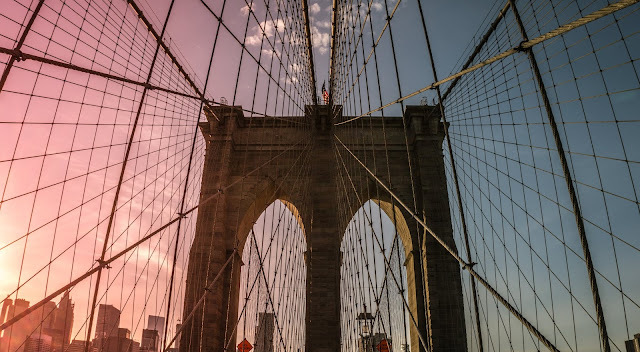 We would like to give you one last tip: be sure to use the free wi-fi upon reaching the top to be able to share all of your stunning photographs. We bet that this visit will not disappoint you when you make your family trip to Lisbon. 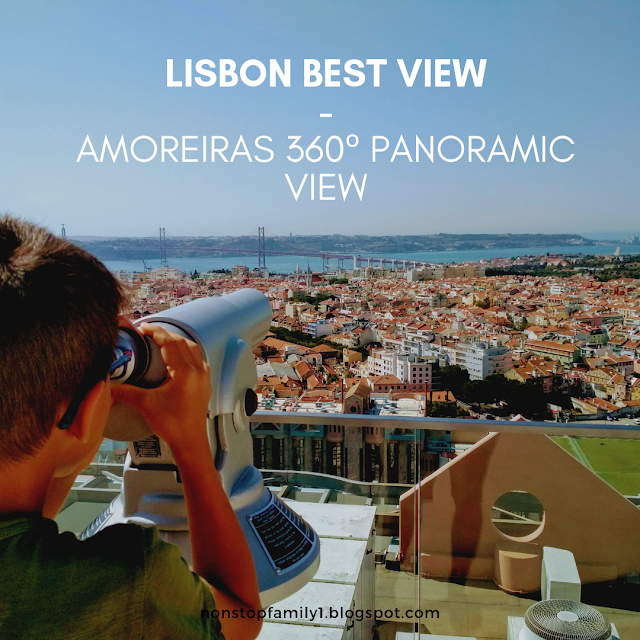 We also invite you to see our 3-day itinerary for a family trip to the city of Lisbon here. Any question, leave your comment that we will be happy to help. 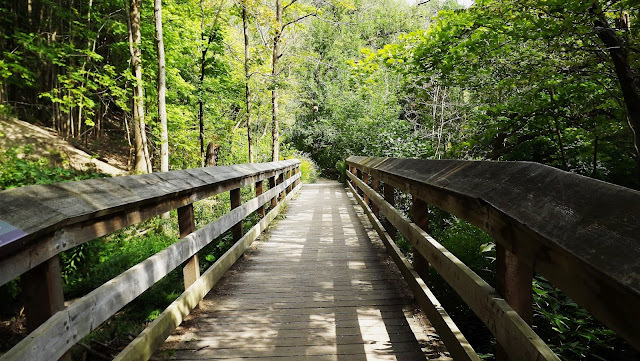 You can also leave suggestions, comments, and do not forget to share on your social networks and see other Non Stop Family - Travel Blog articles.